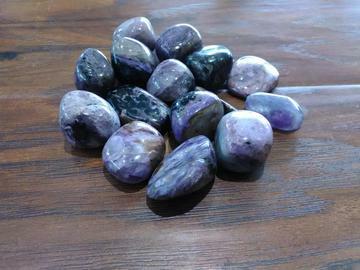 Charoite is a silicate containing elements such as potassium, sodium, calcium, barium, strontium, oxygen, silicon, and hydrogen. Its color is a lavender and deep purple, together with its unusual patterns makes it so unusual it is often mistaken for a synthetic. Chariote grants the courage to start over after repossession. It overcomes job loss in an area of high unemployment and sustains those in prison, boarding school, the hospital or in residential care.